Will California Voters Approve $3.6 Billion Per Year in New Taxes? With the 2018 general election a few weeks away, it’s time to review just how many tax increases are on state and local ballots in California. And while media attention focuses on the statewide tax measures, even bigger money is represented by the sum of hundreds of proposed local tax increases. Every election cycle, the California Taxpayers Association (CalTax) produces a list of local tax and bond proposals. After every election, they provide information as to how many were approved by voters and how many failed. Using CalTax data, it can be seen that in November 2016, California’s local voters approved 181 bonds, mostly for school construction, totalling an incredible $32.3 billion. Annual payments on these bonds will cost California’s taxpayers an estimated $2.1 billion per year. At the same time, local voters approved 159 new tax measures, mostly increases to local sales taxes and parcel taxes, adding another $2.9 billion in annual payments. If you add up all the voter approved new taxes in November 2016, state and local, you have to include not only $5 billion in new local taxes and payments on local bonds per year, you also have to add the voter approved statewide measures. That would include Prop. 51, adding yet another $9 billion in school bonds (estimated payments $585 million per year), and Prop. 55, the extension of the “temporary” increase to state income taxes on personal incomes over $250,000 per year (estimated collections, between $4 billion and $9 billion per year), and Prop. 56, the $2.00 tax increase per pack of cigarettes (estimated collections just over $1 billion per year). Before turning to 2018, it’s important to also note that in 2016 the Democrats recovered their two-thirds majority in the state legislature, meaning they could pass new taxes without voter approval. And in 2017, that’s exactly what they did, adding twelve cents per gallon to the already high state taxes on gasoline and increasing vehicle registration fees. Voila, another $5.4 billion per year in taxes on Californians. When considering how California’s proposed new taxes will fare with voters in November, history is a good indicator. In November 2016, ninety-four percent of local bond measures were passed by voters, and seventy-one percent of new local taxes were approved. Similarly, this past spring, in the primary elections of 2018, California’s voters approved eighty-three percent of local bond measures ($200 million per year in annual payments), and sixty-five percent of new local taxes ($228 million in new taxes per year). Statewide, Californians approved a $4 billion “water” bond (Prop. 68), which equates to another $260 million per year in annual payments. Which brings us to November 2018. 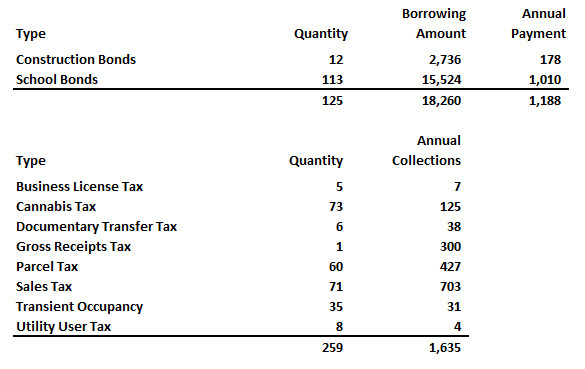 The table below shows 125 new local bonds are proposed. If they are all approved by voters, that will add another $1.2 billion in annual payments. In addition, 259 new local taxes are proposed, which if approved will total another $1.6 billion in annual payments. This time, along with the perennial hikes to sales taxes and parcel taxes, the other popular new mode of taxation is marijuana, with 73 of California’s cities and counties proposing to cash in on sales of recreational cannabis. If historical trends apply this time, California’s voters will likely approve four-fifths (or more) of the local bond measures, and two-thirds (or more) of the local tax increases. This will equate to roughly $2 billion in new taxes and payments on bonds per year. And then there are the statewide initiatives. On California’s November ballot there are four bond proposals, totaling $16.4 billion in additional borrowing. Prop. 1 issues $4 billion in bonds for housing programs and veterans’ home loans. Prop. 2 sells future revenue from the millionaire’s tax for $2 to guarantee $2 billion in bonds for homelessness prevention housing – that’s tax revenue that has to be made up somewhere else, so yes, it counts. Prop. 3 issues a whopping $8.9 billion in bonds for water-related infrastructure and environmental projects. And Prop. 4 issues $1.5 billion in bonds for children’s hospitals. Total payments on these bonds? Another $1.1 billion per year. To summarize, in 2016, voters approved new taxes and payments on bonds (not including the $4 to $9 billion per year in “millionaire” taxes that were not new, but were continued by the passage of Prop. 56) totaling $6.5 billion per year. In the 2018 June primary, California’s voters approved another nearly $700 million in new taxes and payments on bonds. And this November, voters have the opportunity to approve (or reject), $3.6 billion per year in new taxes and bond payments. For the children. For education. For safety. For safe drinking water. The list goes on, and the stories are compelling. But here’s the problem: Even if all of the 2018 tax and bond payments are approved, and those payments are added to the payments on new taxes and bonds already approved in Nov. 2016 and June 2018, the total is “only” $10 billion. Why “only”? Because the estimated payments on public employee pensions in California are estimated to increase from $31 billion in 2018 to $59 billion in 2024, and that is the “normal” scenario, not one reflecting the impact of a major correction in the value of stocks, bonds, and real estate. Money is fungible. When more tax revenues go to pension funds, vital publicly funded programs are either defunded or new taxes are imposed to keep them alive. Similarly, when more tax revenues go to pension funds, maintenance projects that might have been funded using operating budgets, suddenly become capital projects requiring debt financing. Californians may expect a deluge of new tax and bond proposals for many years to come. Picture yourself on Election Day at your local polling place and looking over a lengthy ballot. Or, try to recall when you were at home reviewing your mail-in ballot. In choosing your elected officials on the ballots, it is pretty straight-forward: You vote for the candidate that best matches your interests and values. But what about tax levies and bond measures proposed by local governments and school districts? There are so many factors to consider. How will the new funds help your community or school? How long will it take for bonds to be paid off? Most importantly, what will be the actual financial impact on you and your family? Current law requires that a “tax rate statement” be mailed out to all voters, which includes the best estimate of the highest tax rate for voters, as well as the best estimate of total debt service. 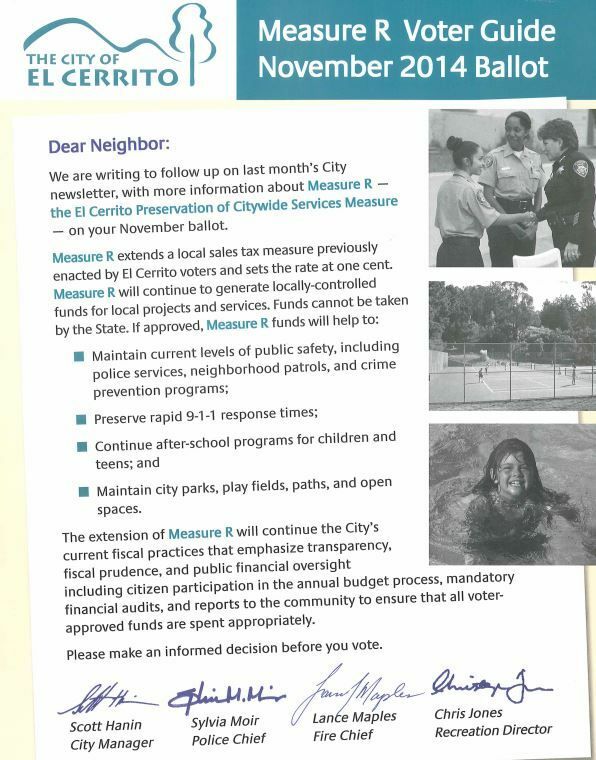 While this information can be helpful, it is often insufficient in aiding voters to estimate how much their property taxes might increase. This is why Assembly Bill 1194 (by this column’s co-author, Matt Dababneh, D-Woodland Hills) is necessary to alleviate this uncertainty and increase transparency for voters regarding the effects that local bond measures may have on property taxes. By providing information upfront, such as the best estimate of the average annual tax rate and the last year when the bond is expected to be paid, voters will have the ability to better understand the bond measures’ impact on their own personal finances. AB1194 was approved by the state Assembly with strong, bipartisan support. It is supported by taxpayer advocacy organizations and by the very people in local government who are most affected if this bill should pass: the California Association of County Treasurers and Tax Collectors. This opposition should concern all taxpayers, as well as transparency advocates. How can providing more information about the average annual tax rates be misleading or even “chilling”? Are opponents afraid that more transparency might give voters pause and cause them to take a closer look at the consequences of the bond measure’s passage rather than blindly voting “yes” down the ballot? Taxpayers should ask themselves if they could benefit from more clarity on these bond measures. If the answer is yes, then we need your support to ensure AB1194 wins approval in the state Senate and moves to the governor’s desk. You can help by contacting your state senator over the course of this summer to urge their support on AB1194 for better voter transparency. Jon Coupal is the president of Howard Jarvis Taxpayers Association. Matt Dababneh is the California Assemblymember for the 45th Assembly District. Thanksgiving falls on Nov. 24 this year, but for politicians in Los Angeles, turkey day is Tuesday, Nov. 8. That’s when they will attempt to carve up taxpayers with at least four proposed tax increases – a sales tax hike and three measures that would increase property taxes. It’s no coincidence that these tax-hike proposals are all on the ballot this year. Political experts believe tax increases have a better chance of passing in presidential elections, when turnout is higher. So California politicians have been studying the polls and the calendar, and they’ve all reached the same conclusion — it’s fine weather for soaking taxpayers. This comes on top of the Los Angeles Department of Water and Power’s five-year rate hikes, recently approved by Mayor Eric Garcetti and the L.A. City Council, which will fund a “city transfer” of hundreds of millions of ratepayer dollars to the city treasury every year. If you think that’s sneaky, wait until you see the surprises in the latest proposed tax increases. The Los Angeles Metropolitan Transportation Authority wants a permanent sales tax increase of one-half of one percent, plus a permanent extension of the 30-year Measure R sales tax passed in 2008. If voters say yes, Metro will have upwards of $120 billion to plan and build transit projects that are described in a detailed countywide plan. But, surprise! The detailed plan can be completely changed at any time with a two-thirds vote of Metro’s board of directors. Nothing is guaranteed except a permanent tax increase. And there’s another surprise. Under state law, this “traffic improvement plan,” as Metro has named it, will trigger super-streamlined approval for massive blocks of apartments within one-half mile of planned “major transit stops.” Transit-oriented developments don’t require studies of the projects’ impact on traffic speed or neighborhood parking. Instead of reducing traffic, we’re guaranteed to get high-density development that jams the streets decades before the transit is ever built. Another proposed tax increase that’s full of surprises is a Los Angeles city bond to pay for housing for the homeless. If the voters say yes, the city will be authorized to borrow $1.2 billion dollars and then pay it back by adding a new tax to property tax bills. Earlier this month the California Policy Center released a study that provided additional evidence that the U.S. stock indexes are overvalued by approximately 50 percent, along with calculations showing the impact of a major downward correction on the solvency of California’s state and local government pension systems. Stocks are now at unsustainable bubble valuations. Not covered in this study, but equally overvalued, are bonds, which pension systems misleadingly categorize as “fixed income” investments in their portfolio disclosures. CalPERS even went so far as to trumpet their success in earning a 9.29 percent return on “fixed income” investments in their most recent press release – a healthy return that offset losses elsewhere and allowed them to earn a marginally positive return of 0.61 percent last year. But “fixed income” investments usually refers to bonds, and bonds are also at unsustainable bubble valuations. Here’s why bonds are overvalued today: Whenever new bonds are issued at lower fixed rates of interest than the bonds that were issued before them, then those older bonds that pay higher fixed rates of interest can be sold for more money than their original price. This is because on an open market, buyers will price a resold bond at a value calculated to equalize returns. When rates go down for new bonds, the prices for existing bonds go up. The problem is that back in the 1980s, bonds were being issued at rates as high as 16 percent, and today, they’re being issued at rates close to zero. After a 30 year ride, interest rate drops can no longer be used to elevate the value of bond portfolios. At a macroeconomic level, every possible investment in the world is overvalued today, because central banks have lowered interest rates to zero in a desperate attempt to continue a decades long disease in which they have spent more than they’ve collected. Governments got to borrow money for next to nothing, and assets kept appreciating. But the binge is almost over, and unlike the savvy super-rich, pension funds can’t just take their winnings off the table. Negative coupon bonds, a desperate experiment that isn’t going to end well. This is all tedious drivel, however, if you are a unionized public employee in California. Your retirement security is guaranteed by “contract.” It’s the result of deals cut between union “negotiators” and the politicians they make or break. As a government employee in California, if you’ve worked 30 years, the average annual retirement benefit you can expect if you retire this year is worth over $70,000. To honor that expectation, CalPERS is already mid-way through their latest reassessment, a 50 percent increase to their collections from participating agencies. And if there is a 50 percent market correction (“fixed income” and equity), expect them to double or even triple their collections from taxpayers. If you are a private citizen trying to prepare for retirement today after, say, 45 years of work and saving, good luck. Because there is no safe investment left in the world. And while you are likely to have to cope with, for example, suspended dividend payments on stocks that are down 50 percent, expect your taxes to go up in every imaginable category – sales, property, income, and hidden taxes embedded in your utility bills and phone bills. It will be “for the children” and “for public safety.” And if there’s a vote required to increase the tax, it will usually pass, because most voters don’t pay property tax, or income tax, or if they do, the taxes are indirectly assessed and invisible to them. This is the oppressive hoax that government unions have perpetrated on the working families they claim they want to protect. They have exempted their own members, government workers, from the consequences of a corrupt financial system where they are leading partners. When governments spend more than they make and have to borrow money, central banks lower interest rates to make it easier to work the payments into the budget. At the same time, lower interest rates goose the value of stocks and bonds, helping the pension funds claim they can earn 7.5 percent per year. And when the house of cards collapses, taxpayers bail out the banks and the government pension funds. The next time a spokesperson for a government union speaks disparagingly about Wall Street corruption, remember this: They are partners with Wall Street. They support overspending for their own compensation and benefits, creating deficits that have to be covered by taxes and borrowing. Their pension funds demand high returns, and the bankers comply, with rates that encourage borrowing and deny ordinary people the ability to save. Now that interest rates have hit zero and are even going negative in an exercise of monetary chicanery that has no rival in history, the end is near. Public sector union leaders need to start remembering they represent public servants, not public overlords who are exempt from the reality that you can only spend as much as you earn. As it is, these union leaders are the overpaid mercenaries of capitalism at its most corrupt. The following table shows the results so far. With bonds, the trend is clear – they nearly all still pass. That’s partly because school bonds only require a 55 percent majority to pass, whereas with most tax increases, passage still requires a two-thirds vote. And while the rate of passage is lower for tax increases, the latest election shows two out of three passing. The data after one week, as shown, indicates that if the “too close to call” decisions end up splitting at the same ratios as the already decided propositions, 66 percent of the tax proposals will pass, and a whopping 93 percent of the bond proposals will pass. (1) The true tax impact is not evident from the ballot label. (2) There is a lot of voter of misunderstanding about how much money we already spend on education. Very few Californians realize we spend, at a minimum, 40 percent of our general fund budget on education. (3) Local taxpayers don’t have nearly the resources or the sophistication to run big campaigns against the teachers unions and the construction industry. (4) Many times, these proposals are placed on the ballot in a way to ensure there is no opposition argument – for example, they are added when there are only 72 hours left to get an opposing argument submitted. Procedural rules are manipulated to suppress opposition. When asked how this could change, Coupal did not seem optimistic, but had a few suggestions. He noted that his organization and other reform groups are supporting bills to require greater transparency on taxes and bonds. In particular, he stressed the need for more public disclosure of the financial impact. Coupal also mentioned the need for more public education, stating that “voters don’t understand that when people say it’s for the kids, it’s actually for the unions. Without dissecting the specific campaign dynamics, voter demographics, and other particular conditions in each case, there isn’t a clear indication why some local tax proposals failed, while two-thirds of them passed. One of the most expensive of all proposed parcel taxes, failed Measure C-16 in San Luis Obispo County’s Cayucos Fire Protection District, would have increased the annual assessment per house for fire protection services from $100 to $500. On the other hand, thrifty voters in Siskiyou County rejected a parcel tax that would have only cost each household $5 per year. Similarly, when it comes to failed proposals to increase sales taxes, there is no common theme in the data. The failed proposals ranged from an increase of an eighth of one percent to a full percent, which mirrored the range of the measures that passed. The explanations were various, including public safety, general services, road and transit upgrades, and library services. Interestingly, two of the failed tax increases, in Napa and Solano counties, only required a majority vote. Ultimately, despite California’s sporadically rebellious populace when it comes to new state taxes – state Propositions 1A through 1E on the state ballot in 2009 were all rejected by voters – their track record on local taxes and bonds remains consistently pro-tax. Voters need to realize that local tax increases do not begin to cover already scheduled increases to pension fund contributions, to fund pension benefits that are – even for non public safety – two to three times more generous than Social Security. Voters need to realize that school bond measures are usually to fund work that used to be paid for out of operating budgets, before the pension and compensation commitments got out of control. And behind these hidden agendas impelling new tax increases, behind every broken budget and faltering service, voters need to understand that government unions are the cause. In 2010, the California State University system issued $352 million in revenue bonds. Earlier this month, it issued $1.1 billion of the same thing. The debt issuance is standard, generally considered to be part of the process to keep pace with growth. And financial disclosures are rich with information; people can go to prison for lying on these things. Comparing the two issuances is a tour of the massive growth of the education industrial complex, a waltz through the luxury world of public, higher education. According to the bond filings, gross revenues in the system more than doubled in the last 10 years, from $608.7 million in 2005 to $1.57 billion in 2014. The increases were generated across the board, in fees from parking to health facilities to the student union, and from continuing education to housing. The revenue has started flowing from places other than tuition, which has remained the same since 2011 after increasing 60 percent for full-time undergrad students between 2005 and 2009 to $4,026. Those increases incensed students, and protests forced bureaucrats to pay attention. Proposition 30, passed by voters in 2012,increased personal income tax on people making over $250,000 to fund education as well. That increase is scheduled to end in 2019. In the meantime, though, schools have figured out other ways into the wallets of students, thus the increased fees. A student in 2010 paid $6,427 to live on-campus, support the student union and use the health facility. The same package today costs $7,958, or 23 percent more. Students are trying to adjust. Some are living off-campus, which has become a cheaper alternative to the dorm. Growth in the number of staff has sharply outpaced increases in the number of students they serve, with growth among administrators and faculty roughly triple that of students. Between 2010 and 2015 the number of administrators and faculty grew from 47,000 to 57,000 – or 21 percent – while rank-and-file employees increased from 47,000 to 60,000, or 27 percent. Student enrollment increased from 433,000 to 466,000, or 7 percent. In the last decade, the system saw two years of year-over-year declines in the number of full-time equivalent students. Accepted students aren’t dropping everything and enrolling today; in 2010, 36 percent of those accepted enrolled; in 2014 that figure dropped to 27 percent. With the continued flow of revenue, the system’s financial obligations have jumped 22 percent to over $5 billion from $4.1 billionin 2010. And the budget? A 26 percent increase to a $8.7 billion budget from $6.9 billion in 2010. The system also receives state lottery revenue: $42 million in 2014, up to $49 million this year. Cal State trustees have allocated part of that to the so-called Early Start program at the state Department of Developmental Services. A portion of the lottery proceeds also goes toward the retirement fund for system employees. The system combined lottery and other funds to send $493 million to the pension system in 2014, up from $400 million in 2010. And just last month, a new round of raises for executives was announced. Is local tax measure success a sign of things to come? As usual, Michael Coleman’s California City Finance website has an excellent recap of local tax measures and how they fared in the recent election. Local ballots contained 268 revenue measures — tax increases, tax extensions or bonds — of which 189 passed, or 71 percent. General-fund city taxes requiring a majority vote. Of them, 61 of 88 passed, or 69 percent. School bonds requiring a 55 percent vote. They fared even better, with 90 of 112 measures passing, or 80 percent. In addition, school parcel taxes requiring a two-thirds vote were perfect on Election Day, with all eight passing. With pro-spending groups making no secret of their desire to raise many different state taxes, does the success of so many local taxes auger well for them? State and local tax campaigns are fought in different environments. The governments closer to the people have a better connection to local voters and generally are held in higher regard than governments farther away. Local tax measures and school bonds usually don’t face well-funded opposition campaigns. At the Capitol Weekly’s election post-mortem conference, it was often pointed out that California’s electorate is made up of two-thirds progressive voters and two-thirds fiscally conservative voters. Obviously, there is an overlap and the election campaign struggle occurs in the overlapping area. Voters locally showed a willingness to pay more. If they get their fill contributing to local government budgets, will they draw the line with efforts to raise state revenue? The success of the local measures will encourage those who want to raise state taxes. The battle will be drawn. The question is: When will the California voters hit their breaking point? We may find out in the 2016 election. This article was originally published by CalWatchdog.com. Over the past few weeks we’ve tried to point out that local tax increases – 166 of them on the November 4th ballot at last count, tend to be calibrated to raise an amount of new tax revenue that, in too many cases, are suspiciously equal to the amount that pension contributions are going to be raised over the next few years. For three detailed examples of how local tax increases will roughly equal the impending increases to required pension contributions, read about Stanton, Palo Alto and Watsonville‘s local tax proposals. It is impossible to analyze them all. To be fair, there are plenty of examples of new capital investment, “construct a new high school,” for example, but they represent a small fraction of the stated intents. On November 4th, Californians are being asked to borrow another $12.3 billion to shore up their public school system. They are being asked to pile another $12.3 billion onto over $250 billion of existing local government debt, along with additional hundreds of billions in unfunded retirement obligations for state and local government workers. They are being asked to borrow another $12.3 billion in order to do deferred maintenance. We are borrowing money to fix leaky roofs and repair restrooms and sewers. This is a scandal, because for the past 2-3 decades, California’s educational system has been ran for the benefit of unionized educators and unionized construction contractors who work in league with financial firms whose sales tactics and terms of lending would make sharks on Wall Street blush. These special interests have wasted taxpayers money and wasted the educations of millions of children. Their solution? Ask for more money. Nobody should suggest that California’s public schools don’t require investment and upgrades. But before borrowing more money on the shoulders of taxpayers, why aren’t alternatives considered? Why aren’t educators clamoring for reforms that would cut back on the ratio of administrators to teachers? Why aren’t they admitting that project labor agreements raise the cost to taxpayers for all capital investments and upgrades, and doing something about it? If their primary motivation is the interests of students, why aren’t they supporting the Vergara ruling that, if enforced, will improve the quality of teachers in the classroom at no additional cost? Why aren’t they embracing charter schools, institutions whose survival is tied to their ability to produce superior educational outcomes for far less money? Why don’t they question more of these “upgrade” projects? Is it absolutely necessary to carpet every field in artificial turf, a solution that is not only expensive but causes far more injuries to student athletes? Is it necessary to spend tens of millions per school on solar power systems? Does every high school really need a new theater, or science lab? Or do they just need fewer administrators, and better teachers? And to acknowledge the biggest, sickest elephant in the room – that massive, teetering colossus called CalSTRS, should teachers, who only spend 180 days per year actually teaching, really be entitled to pensions that equal 75% of their final salary after only 30 years, in exchange for salary withholding that barely exceeds what private employees pay into Social Security? Thanks to unreformed pensions, how many billions in school maintenance money ended up getting invested by CalSTRS in Mumbai, Shanghai, Jakarta, or other business-friendly regions?